If we speak about the term training, we have to worry about designing a programme to support long term learning. Studies show that performing well during some types of training is not a clear indication of learning a skill. I have found being aware of this counterintuitive insight has helped professional and armature golfers. This insight was first demonstrated back in 1929 by M Blodgett. More recently Nicholas C. Soderstrom. Robert A. Bjork of UCLAs Learning and Forgetting Lab have shined a light on this meaningful difference. training is acquiring and practicing is applying. Introducing unwanted outcomes during training can support meaningful learning (Dr Bjork). The feel of a mistake (to fast, to slow) can help you learn something different. I read that Jack Nicklaus introduced mistakes when he trained. Also, studies show that trying to fix isn’t learning. Thus the suggestion is to put attention on what to do different, without thinking about fixing. Players, some under block training and others under random training schedules, were learning three types of motions. Both groups trained for one hour. The blocked group trained each type of motion separately for 20 mins. The group under random conditions trained all three types of motions, one right after the other, not separately. They showed better retention and transfer then the block training group. When training anything, it helps to change the context of the environment every 5 or 10 min. This supports long term learning more efficiently then training in one environment for the entire time you are training. (Goode, Stephen, Magill 1986). 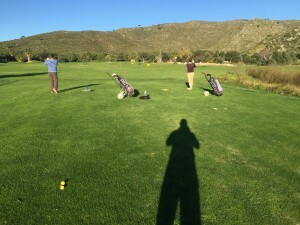 For example: when training golf alignment, do so on a green, then in the fairway, then on a tee, then in a bunker, during the same training session. A common assumption is, that frequent feedback from an external source during the acquisition stage, foresters long term learning. But empirical evidence suggests that delaying, reducing and summarizing feedback is better for long term learning (Schmidt and Wulf 1997). Frequent feedback can be a crutch during training that is no longer present during a later retention requirement. Golfers taken notice: having feedback after each swing hurts progress. If you had one hour to train, it’s not as useful to train for that one hour straight, as it would be to break the hour into four 15 min sessions with breaks in between. Also training something different in each 15min session is more useful then training the same thing in each session. Thanks to Michael Hebron for spreading wisdom.